Welcome to the Western Wood Preservers Institute's Fire Retardant-Treated Wood website. WWPI is a nonprofit trade association representing the producers of quality fire retardant-treated wood in western North America. 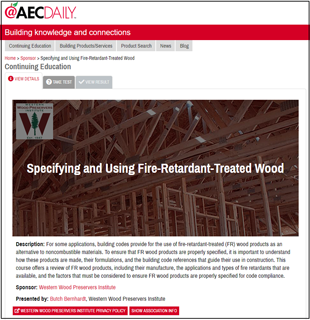 Learn about fire retardant wood, how it works and how to specify it with a new web course on the AEC Daily online education platform. The course Specifying and Using Fire-Retardant-Treated Wood is now live and is part of a new online eUniversity on preservative- and fire-retardant-treatd wood products. The free course can be downloaded and users can review it on their own schedule. The illustrated course features a history of fire retardant wood and how those products are used in construction today. It explains how fire retardants work to protect wood, the applications and types of fire retardants that are available and the factors that should be considered to ensure FR wood products are properly specified for code compliance. At the end of the course, users can take a 10-question quiz to earn Continuing Education Units (CEUs). The fire retardant wood course has qualified for CEUs from 26 different organizations, including American Institute of Architects, National Assn. of Home Builders. and National Assn. of the Remodeling Industry. This is the second online course in the new Preserved Wood online eUniversity developed by WWPI and AEC Daily. The course Preservative-Treated Wood: Specification and Use provides a detailed overview on preserved wood products. Sections include how wood is preservative treated, specifying using AWPA Use Categories, Best Management Practices for aquatic wses and the environmental benefits of preserved wood. Download the Fire Retardant Wood course today! When it comes to protecting wood against fire, infusing fire retardants into the wood fiber offers more durable protection than surface coatings. The advantages of pressure treating compared to surface coatings are detailed in the new FireSpec sheet Fire Retardant Treating vs. Coatings. 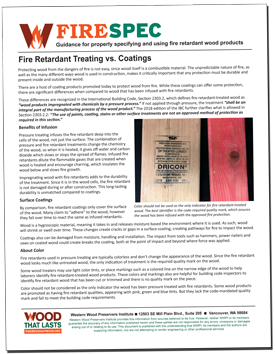 The one-page guide explains the benefits of infusing fire retardants into sawn lumber and plywood for protection, noting code requirements where paints, coatings and stains are not approved under the codes for fire protection. While some coating are promoted as the same as pressure treating, they can be damaged during construction or over time from moisture, handling or changes in the wood. The FireSpec sheet provides guidance on identifying approved fire retardant wood, noting that color should not be the only indicator the wood has been pressure treated. The presence of a code-mandated quality mark is the best way to know the wood has the proper protection against fire. Click here to review the FireSpec sheet. Learn how fire retardant wood is made and see why it offers superior protection against fire. See the code-compliant quality marks that provide key information about fire retardant-treated products. Visit the Fire Resistant Wood Technical Library for up-to-date information and recommendations for fire retardant wood. Looking for fire retardant treated wood? Check out the Sources Guide and download the listings for the WWPI Member companies supplying fire retardant lumber and plywood products. Review the benefits of pressure treating for fire retardants compared to coatings and see why building codes recognize this treatment process. Explore the extensive testing pressure treated fire retardants must pass to be officially recognized within the building codes. Find out about all things related to preservative-treated wood products on the PreservedWood.org website. There are many WWPI Member manufacturers who can provide the fire retardant wood products you need. 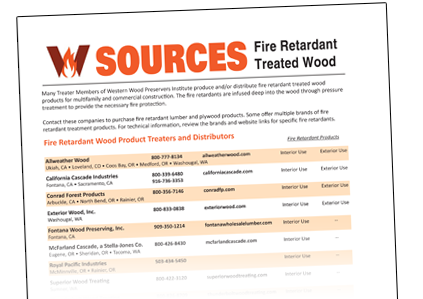 Use the Fire Retardant Wood Sources Guide to find those treaters close to your location who offer quality fire retardant wood products. The guide lists companies, plant locations, sales contact information and the type of treatments (interior and/or exterior) they offer. Also, download the Sources Guide to find the quality fire retardant wood products available from the top treaters in the West.